The Iveco Vision has been built by Iveco to test and develop new technological solutions and future modes of transport. 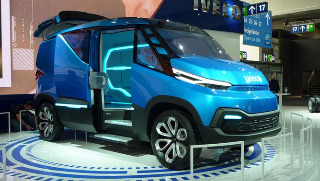 Its creation is centred on low environmental impact mobility and safety and uses a dual energy system which has been developed by Iveco to further minimise environmental impact. The system is designed to self-adapt to the most suitable traction mode – one is exclusively electric, ensuring zero tailpipe emissions and low noise levels for inner city areas, and the other is hybrid (thermoelectric) and suitable for longer journeys and extra-urban missions, reducing consumption and CO₂ emissions by up to 25 per cent compared with diesel-only equivalents. Other features include ‘see-through’ front pillars for unrestricted driver visibility, plus a rear-view camera displayed on a panoramic screen above the windscreen. There is also adaptive LED lighting, a photovoltaic roof which uses sunlight to generate battery power, and advanced GPS tracking. The Vision can also automatically adjust its tyre pressures, according to the weight of the load it's carrying, to deliver optimum road-holding and fuel-efficiency. Designed with delivery drivers in mind, Vision uses a fully automatic system for load management based on a series of sensors which identify the goods being loaded and then indicate the correct positioning of these within the loadspace, triggering air-bag style containment devices which prevent the movement of larger packages. As well as protecting valuable goods from damage, this improved space management makes loading and unloading faster, leading to obvious efficiency gains for the operator. The driver manages the full suite of on-board technology via a high-integration touch screen device, which communicates seamlessly with the on-board electronics.